Chronic Myelogenous Leukemia (CML)-initiating cells (CICs) express the hybrid oncoprotein BCR-ABL at the highest levels compared to their differentiated progeny but fail to expand at the same rate as downstream leukemic myeloid cells. 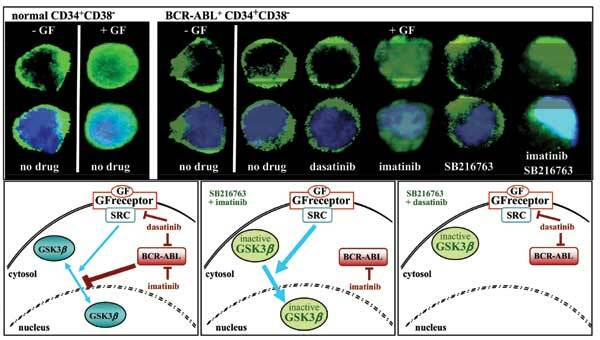 Moreover, the primitive stem cell clone that originates the indolent CML chronic phase (CP) remains almost invariant as the disease evolves to a fatal blast crisis (BC). Compared to their healthy counterpart, the most dormant BCR-ABL+ CICs show the tendency to remain in a somewhat unusual ‘proliferative quiescence’, i.e. a prolonged low-energy viable state that restrains the frequency of symmetrical (self-renewing) cell divisions while enforcing cell cycle entry and myeloid commitment under cytokine support. Over the past few years, we and others have proposed the nutrient-sensing protein serine/threonine kinase GSK3β (glycogen synthase kinase 3β) as an attractive target to eradicate leukemia-initiating cells while sparing normal haematopoiesis. Beyond its natural negative effects on self-renewal, through the inhibitory phosphorylation of β-Catenin (Wnt signalling) and c-MYC (Hedgehog signalling), hyperactive GSK3β is reportedly crucial to link energy metabolism and nutrient availability to stem cell homeostasis processes. This review will integrate current evidence pertaining to the biological relevance of GSK3β in normal and malignant haematopoiesis, with particular emphasis on its role(s) at the CML CP stage and BC transformation. Preclinical evidence earmarking the use of novel small-molecule inhibitors of GSK3β as promsing anti-leukemia agents are also discussed. Chronic myelogenous leukemia, leukemia-initiating cells, hematopoietic stem cells, self-renewal, GSK3β, BCRABL, therapy resistance.